I can report that one of my customers, performing intensive image processing, found that DISABLING hyper-threading on a Nehalem-based workstation, actually IMPROVED performance considerably. How is it possible that Intel's Xeon X5670 rig returns 19k+ for a score while AMD's magny-cours returns only 2k+?? 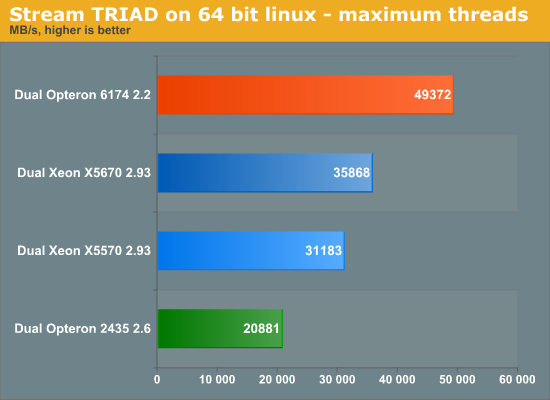 I only question the results of this benchmark chart because Intel's Xeon X5570 rig returns only around 1k. How can a X5670 be 19x faster than a X5570?? And I doubt the same is true for the magny-cours by being just 10.5% of what the X5670 can do. If you guys need help with setting up or running the Fluent/LS-DYNA benchmarks let me know. I see that you don't really spend as much time writing or tweaking it as you do with some of the other programs, and that to me is a little concerning only because I don't think that it is showing the true potential of these processors if you run it straight out-of-the-box (especially with Fluent). Also, the parallelization method (MPICH2 vs. HP MPI) makes a difference in the results. You want to make sure that the CPUs are fully loaded for a period of time such that at each iteration, there should be a noticable dwell time AT 100% CPU load. Otherwise, it won't really demonstrate the computational ability. I have followed your articles from the early day's at Ace's and have a good respect for the technical accuracy of your articles. It appears that the X5570 scaling between 4 and 8 cores has very little gain in the Oracle Calling Circle benchmark. Furthermore, the 24 cores of MC at 2.2Ghz are way behind. Westmere appears to do quite well, but really should not be able to best 8 cores in the X5570 with all else being equal. I have heard some state that the benchmark is thread bound to a low number of threads (don't know if I am buying this), but surely something fishy is going on here. It appears that there is either a real world application limit to core scaling on certain types of Oracle database applications (if there are, could you please explain what features an app has when these limits appear), or that the benchmark is flawed in some way. I have a good amount of experience in Oracle applications and have usually found that more cores and more memory make Oracle happy. My experience seems at odds with your latest benchmarks. I am starting to suspect the same. I am going to dissect the benchmark soon to see what is up. It is not disk related, or at least that surely it is not our biggest problem. Our benchmark might not be far from the truth though, I think Oracle really likes the big L3-cache of the Westmere CPU. "Also notice that the new Xeon 5600 handles DDR3-1333 a lot more efficiently. We measured 15% higher bandwidth from exactly the same DDR3-1333 DIMMs compared to the older Xeon 5570." That is not exactly the reason, I think. The reason ist you populated the second memory-bank in both setups.